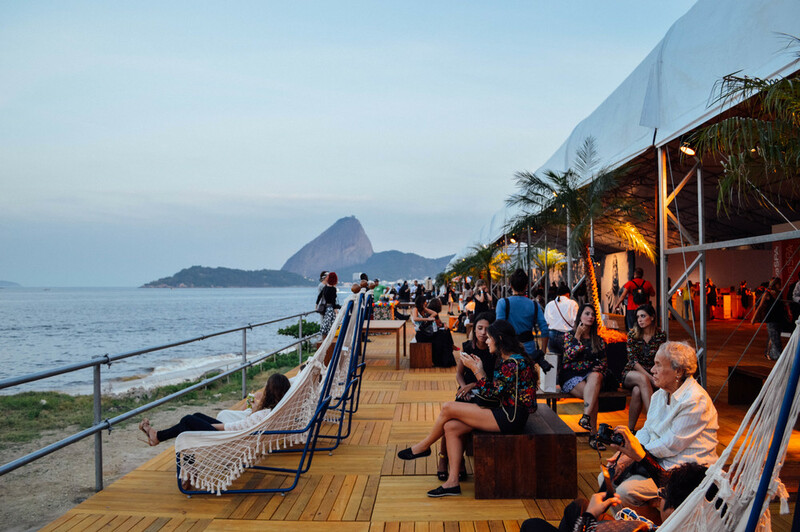 From April 1st to 11th, the most important Brazilian's Fashion event happened, the Fashion Week. The event is usually every year promoted by two cities: São Paulo and Rio de Janeiro. By an Instagram Brasil invitation, I could photograph and be part of this huge experience at Rio's. The Marina da Glória succeed as the hosting place at Rio de Janeiro. Most of the reasons, because of the view from the balcony. It was possible to see the Guanabara Bay and the Sugarloaf, Rio's famous sightseeings places. The event's structure was very well organized. A large corridor connecting the two show stages, was perfect for socialize and observe amazing photographies that were displayed over the walls. "Latin Lover" - Oh, Boy! Guatemala and the Central America have inspired Oh, Boy!’s new summer collection, “Latin Lover”. Typical “kite” dresses referring to the Central America culture, with a mix of colors, textures and forms turn a visual appeal into a beautiful experience. Espaço Fashion provided a mixture of Brazilian cultural festivities in its new collection “Chegaê". The cultural identity of the country is evident through the vibrant hues of blue, green and papaya. Dresses and skirts, exploring volume and asymmetry stand out along the geometric lines and shaped details.